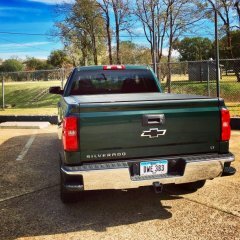 https://www.automobilemag.com/news/2020-chevrolet-silverado-hd-heavy-duty-price-photos-specs/ 5th paragraph: “While the half-ton full-size GM pickups adapted mixed-material construction for 2019 in order to cut weight, the HD Silverado sticks with all steel for its ladder frame and body.” No aluminum. I also heard one of the engineers say it but can’t locate the video right now. It’s amazing that not a single person at the dealership has any idea about the features of one of the largest volume models chevy sells. Just proves that the consumer has to educate themselves cause the people there to “help” don’t have a f”&[email protected]@$) clue! Hahahahah... someone at GMC screwed up... they have taken the photo down from gmc.com. Guess it wasn’t supposed to be released yet. Supposedly they are revealing at the Houston auto show at 7:15pm. We’ll see. I have a 2016 Sierra 3/4 ton with the 6.0. I don’t pull a fifth wheel but do pull a travel trailer that weighs about 9400# when fully loaded. Truck and trailer weigh about 17500 combined when traveling. I’ve traveled about 4000 miles this year with the trailer and I average about 7.5-8 mpg pretty consistently. Love the truck and have not come across anything she couldn’t handle while traveling. Hope this helps! Looks good so far. It looks like they will be changing the styling for the 3/4, 1 ton trucks which I like a lot. Always wanted them to be easier to differentiate. Don’t know why just my taste I guess. Is it just me or is everyone super negative about this release. After seeing the trail boss did anyone really think GM was going to put out a heavily modified off road truck? People keep saying they should make something to compare to the raptor or the trd pro or zr2... if they did you’d be bitching about how “new Sierra is just a raptor knock off”. Can’t win. If you want a raptor GO BUY ONE and join a ford forum. In my opinion, I like it. It seems to be a little more like the Denali as far as options and tech but without all the godawful chrome everywhere. I like the idea that I can get the features I like without buying a Denali. All this being said without ever seeing one in person, as I’m sure nobody complaing about it on here has. Got another email with a new teaser! I like it so far. I hope to like it better than the Silverado. Some special features for the Denali would be nice. Awwww... that would make sense. Looks like the mode selector in the acadia. Anybody else catch the knob above the 4wd selector buttons? It looks an awful lot like fords backup assist. Maybe some tech they haven’t announced yet? Guess we’ll find out soon enough! I know it's been awhile but I figured I'd update this just in case someone else was looking for this info. I can confirm that the diesel running boards will fit on the gas truck. Bolted up in about 20 minutes. They don't come with instructions but if you are at all mechanically inclined you'll figure it out pretty quick.